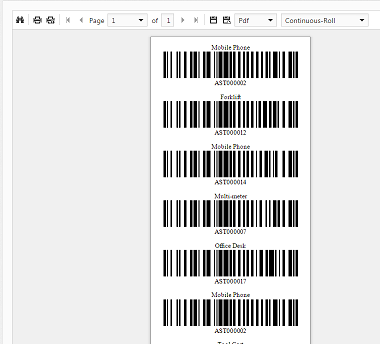 Now you can print barcode labels in Asset Manager Web Edition, just like in the Windows versions. Go to the main "Reports" page. Select the Barcode Labels report. Select your label size, filter, and paper size. Click the Printer icon, and confirm the label preview before sending it to your label printer. Asset Manager Web Edition works with sheet feed and continuous feed printers. Sheet feed printers are regular paper-type printers which you can load with label stock to print an entire sheet of barcode labels at once. Continuous feed printers print barcodes one at a time on a "roll" of labels. Choose the paper size to match your label printer. If you are using a continuous feed printer, you may need to choose "Continuous-Roll" or "Label-Roll", depending on your specific printer and print driver combination. If you prefer not to print your own labels, you can instead purchase high-quality, pre-printed barcode labels on sturdy label stock and then enter the barcode number from the label when adding assets to the system.